7th Toronto Regiment, Royal Canadian Artillery has strength of just under 200 part-time soldiers organized into three batteries: 130 Battery, as a headquarters and training battery, 9 Battery, as a gun battery, and 15 Battery as a mortar battery. The day to day operations of the regiment are supported by a full-time cadre that consists of approximately ten officers and non-commissioned members who include several members posted in from the Regular Force (the full-time Army). As full-time staff, they prepare training exercises, conduct the unit’s routine administration and ensure that the unit’s plans and orders conform to the larger needs of the Canadian Army. The Regiment is also equipped with four 81mm mortars that may be used to engage enemies and provide defence support against targets at ranges of up to 4 kilometers. Each soldier is equipped with the C7A2 service rifle, a 5.56 millimetre automatic rifle standard to the Canadian Armed Forces. 7th Toronto Regiment, Royal Canadian Artillery also possesses an array of light and medium machine guns along with a handful of portable anti-tank weapons. 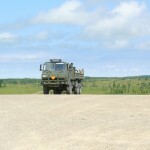 It is also equipped with lightweight combat radios and several transport trucks. 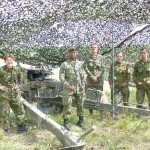 Soldiers of the unit are issued operational uniforms and personal equipment in the Canadian Digital Pattern (CADPAT) camouflage. Soldiers of 7th Toronto Regiment, Royal Canadian Artillery augmented the Canadian Forces presence at the 2010 Olympic Games in Vancouver, as well as provided protection and security during the G20 and G8 summits, the same year. The unit has also deployed individual soldiers to Afghanistan to augment their Regular Force colleagues from 2002-2012. More recently solider’s have been deployed to the Middle East, Latvia and Ukraine on various NATO missons. Lieutenant-Colonel Navraj (Nav) S. Grewal, CD. LCol Nav Grewal was born in North York and is the older of two children. His younger brother, who recently retired from the Regular Force, is three years his junior. LCol Grewal’s parents immigrated to Canada from Kenya (father) and India (mother) in 1977, where his father began work in the information technology field, and mother took further schooling. 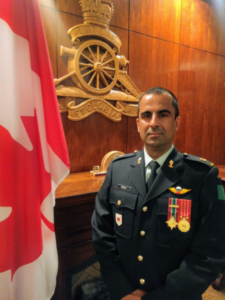 LCol Grewal completed a Bachelor’s of Science from the University of Toronto (2002), and later enrolled in Seneca College to pursue a diploma in Civil Engineering Technology (2006). LCol Grewal’s full-time career is as a Civil Engineering Technologist with a private civil engineering consulting firm in Markham. He is the Technical Manager for the design department in the Industrial, Commercial and Institutional division in the Urban Development group. LCol Grewal joined 7th Toronto Regiment in 2001 as an Officer Cadet in the Reserve Entry Scheme (Officer) program, and has worked through all artillery field positions within the unit. Additionally, he completed the airborne course and provided support to the Queen’s Own Rifles jump Company as their Forward Observation Officer. He was fortunate to take part in D-Day ceremonies in France with a group of military parachutists, where they completed a commemorative jump onto a drop zone near Juno Beach. Currently, LCol Grewal is the Unit’s Second-in-Command (2ic). For a period of one year, he was the Acting Battery Commander (BC) for the mortar battery, 15 Battery as well as the 2ic. LCol Grewal has also served as the BC for 9 Battery and as BC for 130 Battery. He thoroughly enjoyed being able to steer the training of a Battery and to try different training aims and objectives. Prior his position as BC9, he was posted with D Battery, 2nd Regiment, Royal Canadian Horse Artillery, as the Surveillance and Target Acquisition (STA) Troop Commander and the Battle Group’s Information, Surveillance, Targeting, Acquisition and Reconnaissance (BG ISTAR) Coordination Centre Officer for Task Force 1-10 (1st Battalion, Royal Canadian Regiment BG), Kandahar, Afghanistan. In this position he was responsible for coordinating the ISTAR resources that were available to the BG (ie, persistent surveillance systems, Reaper, Predator and Heron UAVs, airborne reconnaissance, fast air etc…) and planning ISTAR coverage for specific operations and daily standing surveillance tasks. He worked with Task Force Kandahar and multi-national forces who operated the surveillance platforms and targeting. LCol Grewal also took part in current operations and coordinated dynamic targeting and joint fires through the Tactical Operations Centre. During his time with D Battery, he completed several courses, which included Light Armoured Vehicle (Observation Post Variant), STA Troop Commander, Fire Effects Coordination Centre Officer, Close Combat Attack and various others. The experience LCol Grewal gained from his time with 2 RCHA and subsequent tour was very enjoyable and extremely fulfilling. During his free time, LCol Grewal is an amateur woodworking, where he designs and builds fine furniture. His projects include bookcases, media cabinets, sideboards, tables and a kayak; he hopes to one day build a cedar-strip canoe. 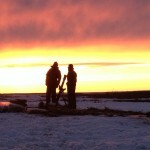 In the coming years, he plans to develop his metal working, welding and iron forging skills. LCol Grewal is a motorcycle enthusiast and enjoys tearing it up on his Harley Davidson. Some of his favorite Google Play playlists include ‘Chill Pool Party’, ‘Dusty Springfield Radio’, ‘Retro Cocktail Party’ and ‘Space Age Bachelor’. LCol Grewal was promoted to his present rank and took command of 7th Toronto Regiment, RCA on 10 Sept 2018. CWO Cooke joined the 11th Field Regiment, Royal Canadian Artillery in February 1987. In 1989 CWO Cooke graduated from his Combat Leader Course and returned to the guns to work as a gun 2IC. CWO Cooke joined the 11th Field Regiment, Royal Canadian Artillery in February 1987. In 1989 CWO Cooke graduated from his Combat Leader Course and returned to the guns to work as a gun 2IC. In 1991 CWO Cooke graduated from his Detachment Commanders Course and was immediately employed as such until 1993 when he again moved into the Command Post to work as a technician/2IC. Following his promotion to Sergeant in 1997, and graduating from his Command Post Supervisor Course, CWO Cooke was employed as the Technical Supervisor for 11 RCA. In 2000 CWO Cooke was promoted to WO and continued to serve as the Battery CP Supervisor until 2003. That year CWO Cooke transferred to the Land Forces Central Area CIMIC Detachment in Toronto and subsequently deployed to Bosnia for Operation Palladium Rotation 13. Employed as a CIMIC team leader and then rerolled into the 2IC of the Mobile Observation and Surveillance Team, CWO Cooke worked closely with Bosnian civilian and international actors in his area of operations. In 2005 CWO Cooke deployed to Holland to teach on the NATO CIMIC course. He returned later that year to 11 RCA and assumed his role as Battery Technical Supervisor. 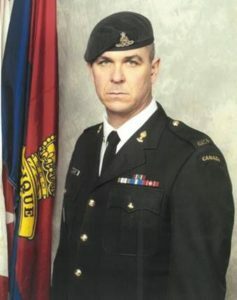 In 2007 CWO Cooke deployed to Afghanistan as the Troop Command Post Supervisor with Delta Battery of the 2nd Regiment, Royal Canadian Horse Artillery. Following his deployment CWO Cooke returned to 11 RCA and assumed the position of Field Battery Sergeant Major. CWO Cooke attended his DP4 Battery Sergeant Major Course in 2010 and then his Advanced Leadership Course in 2011. CWO Cooke took over as RSM 11 RCA from 2011 to 2015. In 2015 CWO Cooke took over as RSM of 31 Combat Engineer Regiment before subsequently taking over as the Acting Regimental Sergeant Major for 32 Signals Regiment in Toronto and Borden. He is currently the Regimental Sergeant Major for the 7th Toronto Regiment. CWO Cooke was born in Halifax, Nova Scotia in 1969. CWO Cooke attended High School in Guelph, Ontario, and graduated from Conestoga College in 1993 with a diploma in Civil Engineering Technology. CWO Cooke currently lives in Milton, Ontario with his partner Susan. CWO Cooke has two boys. In his civilian job, CWO Cooke works for Toyota Motor Manufacturing Canada as a Team Leader in the Weld Shop, where he has worked for the past 20 years. CWO Cooke enjoys outdoor activities and spending time with his family. HCol Downs became the Honorary Colonel of the 7th Toronto Reg’t, RCA on 22 May 2017. 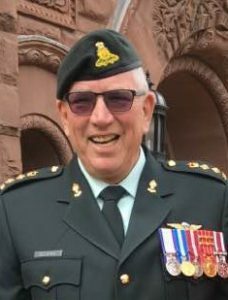 LCol (retd) Barry Downs was born in Toronto, Ontario, on June 21 1946 at St. Michaels Hospital, and born into a 5 person family, with 1 brother and 1 sister. He is currently married to his wife Judy of 42 years. LCol Downs pursued a business degree at the Ryerson University from 1966-1969, and later his masters at York University – Schulich School of Business from 1983-1985. He began to pursue a career in insurance, where he worked for insurance companies such as Wellington, RBC, Royal, Canadian Surety, and held titles of Vice President of Property Casualty Insurance and Marketing. Things changed in 1997 once he decided to finance Partners Indemnity Insurance Brokers Ltd. Founded in 1923 and centralized in Toronto with office networking across Ontario, his company offers commercial and personal insurance. Today, LCol Barry Downs is the president and CEO of one of the top private insurance broker companies in the country, and is the Director for both the Canadian Forces Liaison Council and Commissionaires – Great Lakes (2010). LCol Downs began his military career as a Gunner of 7th Toronto Regiment, Royal Canadian Artillery in 1965, at the young age of 19. He shortly commissioned from the ranks after a year in the regiment, and completed his artillery officer’s course in Petawawa the following year. He was appointed the GPO in 9 Bty for the next 5 years, where he developed as a young officer, and became a Forward Observation Officer for the following 5 years. In 1972, he served amongst 1 Airborne Battery in Jamaica for 6 months in conventional jungle warfare exercise, where he received his jump wings. He later participated on joint exercises with the Queens Own Rifle as an Airbourne Forward Observation Officer. In 1975, LCol Downs was appointed the Battery Commander for 9 Bty, where he claims he spent “an eternity”. He spent approximately 2 years working at Division HQ, where he was the operations, special projects and training officer. In 1977, LCol Downs participated in the first ever CIOR (Competition International Officers Reserve), which consisted of NATO countries. He spent 4 months training with the Marine Corp in the United States, and then England. The competition consisted of physically demanding challenges and obstacles. In 1988, LCol Downs was appointed the Commanding Officer for 7th Toronto Regiment (click here to see the Change of Command Program). He enjoyed all his jobs, and appointments. In particularly, his favourite job was being the commanding officer, where he recalls being the commander for a joint exercise, which contained all artillery regiments in Ontario and 2 Royal Canadian Horse Artillery in Petawawa. He had the privilege leading and commanding a total of 750 individuals. In 1992, LCol Downs was the Director of Staff at the Command and Staff College in Kingston, Ontario. Shortly after, became the Senior Staff Officer at Division HQ, a Canadian delegate to NATO (CIOR) for 3 years on reserve training matters and was a liaison officer for the Canadian Forces until his retirement in 2002. LCol Downs’ military service was 37 years from 1965-2002. 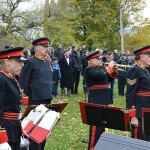 The Toronto Artillery Foundation was created in 1978, 29 individuals made the founding members, but LCol Downs is one of the few that are still active. He currently resides on the board of trustees as a member, and is also on the investment committee along with Col K. Effective May 2017, LCol Downs will be the Honourary Colonel for 7th Toronto Regiment. Presently LCol Downs has worked hard to what he has achieved today. His goals are to continue to expand his company, until he can freely enjoy his hobbies, such as travelling, staying active and playing golf. He enjoyed golf so much he played 93 times last year, but certainly his true intentions are to make those 93 days to 365. 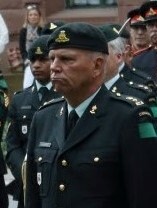 Mark Clearihue was appointed Honorary Lieutenant Colonel of 7th Toronto Regiment, RCA, by Ministerial Order in October, 2016. The son of an RCAF WW2 veteran, HLCol Clearihue was born in Owen Sound, ON. Raised from an early age in the United States, he graduated from Colgate University in 1974 with a Bachelor’s of Arts (Economics). He excelled as a distance runner, was a high school state champion and won 12 varsity letters in Cross-Country and Track while at Colgate. Returning to Canada in 1975, HLCol Clearihue entered the banking industry and enjoyed a 39 year career with TD Bank Group where he held successive positions in Financial Analysis, Commercial Lending, Branch Management, and Regional Sales Leadership. His final responsibilities centered on leading TD’s Secured Lending sales teams across Canada. He retired from TD in 2014. HLCol Clearihue is a Director of the Juno Beach Centre Association, which oversees the Juno Beach Centre, Canada’s Second World War museum and cultural centre located in Normandy, France. The Centre pays homage to the 45,000 Canadians who lost their lives in defence of Canada during WW2. He is a member of Canada Company, a charitable, non-partisan organization that serves to build bridges between business and community leaders and the Canadian military to help CAF personnel receive welldeserved support, care, and recognition. HLCol Clearihue is a challenged golfer, an occasional jogger, and a novice cyclist. He is a member at Mississaugua Golf & CC and The Classics Golf & CC in Naples, Florida. He and his wife Judy reside in Mississaugua. They have two sons and are looking forward to becoming grandparents in 2017. Check back soon for more on HLCol Clearihue.